Hobbit House Camping, Maryland- Unique camping experience! Camp Out in our New Hobbit House! Maple Tree Campgrounds is excited to share our newest edition to the campgrouds, our very own Hobbit House! • Wooded site, available for year-round use. Because the structure is underground, it offers natural climate control (which gives it a nice air conditioned feel in the summer). • The roof is beautifully naturalized with wild flowers. • Outside, there is a thatch covered porch, with solar fairy lights. 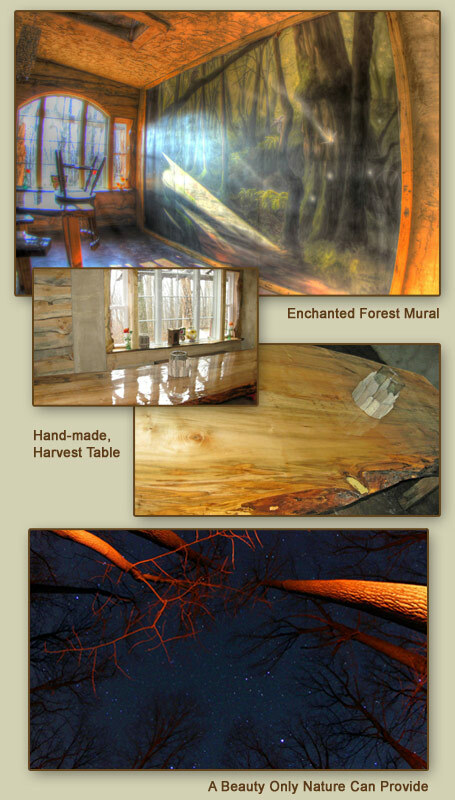 • Inside, there is plenty of natural light, a mural of an enchanted forest, and a unique hand-made harvest table that can seat eight people. • Two night minimum on weekends, except for field sites. • 30% off sites on Wednesdays. • Memorial and Labor Day weekends have a three-night minimum and require full payment in advance. • We do not have accommodations for RV's. • Please be sure to read the Camp Rules. • Click here to download a Camp Map. Check in is anytime after 2:00 p.m., please call if you will be checking in later than 9 p.m. on Fridays or after 5pm Saturday -Thursday.Check out is 1 p.m.. We prefer no one comes after 11 p.m. without prior permission. Please Note: All deposits are non-refundable. If you cancel, your deposit will shift to a Sunday through Thursday credit. No shows and no call will be charged for entire reservation. Reserve the Hobbit House for $140.00 per night, for up to 4 people + 2.75% credit card processing fee. Click here to book online, call 301-432-5585, or email us.